Farmer Meg's Digest | Help Name the Buns! Home » livestock » Help Name the Buns! Posted August 8th, 2011 by Meg & filed under livestock. I just got back from a Rabbits 101 workshop at Cold Antler Farm and, of course, I bought the breeding set that Jenna had waiting at the farm for attendees to buy. A recommended number of rabbits for the backyard breeder to start with is usually a buck (male), and two does (female) so that’s precisely what I got! I’ve named the buck “Ghost” for obvious reasons, but the two little ladies still need names. So, without further ado, here’s the rest of the gang! 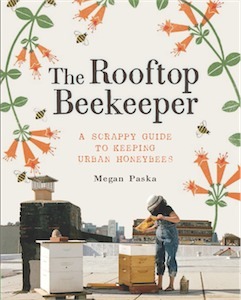 I’ve got a jar of rooftop honey for each of the best names for ’em.